Churches and congregations operate under strict budgets and have different financial needs than the average client. RHINO’s prefabricated metal church buildings for sale, offer amazing customizations, while keeping building and construction costs affordable. Every congregation is distinctive, which is why we offer houses of worship that can be designed to fit your church’s particular needs. RHINO steel church buildings offer exceptional features to protect your investment, so your tithes can be spent on growing your congregation rather than on constant facility maintenance and repair. RHINO has metal church buildings for sale that can be designed to include classrooms, a youth center, administrative offices, a counseling center, conference rooms, choir and music rooms, and kitchens, as well as meeting rooms or fellowship halls for church banquets and social gatherings or large wedding receptions. SO WHY CHOOSE RHINO STEEL CHURCH BUILDINGS? Experience: RHINO has delivered thousands of steel buildings all across North America. 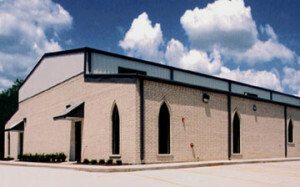 We have years of knowledge designing and constructing steel church buildings. Integrity: Our mission has always been to offer the finest building at the most affordable price, while providing exceptional service before, during, and after the sale. This dedication extends to our prefabricated church buildings as well. This commitment to quality has earned RHINO an A+ rating with the Better Business Bureau. Over 33% of our new orders in the past twelve months have come from returning customers or referrals from satisfied RHINO building customers. Value: RHINO steel church buildings are assembled with prefabricated steel components, using high-strength bolts and self-drilling screws, and go together quickly and easily. All RHINO metal church buildings for sale can be erected in a fraction of the time it takes to construct using other building systems. Many of our metal building churches have been erected by the parishioners themselves in just a few days, using our easy-to-follow instructions. Our prefab church buildings are designed to be durable and beautiful, retaining their value for decades of service with virtually no maintenance. Our commercial-grade steel framing is guaranteed to meet or exceed all local building codes for the lifetime of the church building. Strength and space: RHINO steel church buildings are built strong to last long. Because of the superior strength of the rigid-steel frame, our structures can clearspan up to 150’ on a standard order, allowing your sanctuary to be completely open and unobstructed by support columns. With our metal church buildings for sale, we can provide spans of 200’ or wider with a custom quote. Widths up to 480’ are possible with a support column in the center. And building height is no problem with a RHINO steel system either. Your house of worship can enjoy towering 40’ ceilings on a standard design, or even higher with a custom quote. Any length is possible. As your congregation grows, so can your building by simply adding more steel framing at either end of the structure. Options: Although our standard buildings are available with your choice of 1:12 to 4:12 roof pitches, higher pitches are available with a custom quote if a more dramatic sanctuary ceiling is desired. With the optional upgrade Pro-Value Insulation Package, your church building can also be extremely energy-efficient, saving your congregation thousands of dollars over the lifetime of the structure. Visit our Pro-Value Options and the Metal Building Options for details. Call our experienced steel framing specialists today to discuss steel church buildings, or to learn about our metal church buildings for sale at 940.383.9566. Share the post "Steel Church Buildings"